Note: Since Working for the Mandroid is not on Blogger, we've recently removed the Google Friend Connect widget from the sidebar. If you feel inclined to follow us and our adventures in bookland, feel free to connect through the new Networked Blogs or Google+ widgets on the lefthand side. We can also be found on Twitter at @workformandroid and on Facebook here. Can I be completely honest for a minute? I'm not too fond of the weird names and I regularly replace a character's given name with one I make up, especially if they're called something I couldn't imagine pronouncing. Generally unique character names - unless it's set in a alternate fantasy world or way, way in the future - just seem like an author trying to be clever in the easiest way possible. But that wasn't even remotely the question. Unique names! Daeneyrs Targaryen! It was the first that came to mind, probably because Fernando was watching Game of Thrones re-runs last night. I also am fond of that name because it means everyone calls her Dany, which is not a unique name at all. She also lives in an alternate old-school world with magic, so there's good reasons to have weird names. Tithe had a character that was refered to as "Doughboy". That sort of gave me a creepy feeling. I had a hard time with Katniss for a while and Zaphod Beeblebrox drove me insane (despite his alien nature) throughout The Hitchhiker's Guide to the Galaxy series. I read pretty quickly and weird names, especially ones difficult to pronounce, are like throwing stop signs in my way with no notice. There are probably others, but I've really been wearing my grumpy pants while writing posts lately, so I'll move along. Q: Book Blogger Pride: What do you take pride in when it comes to blogging? Some of my proudest moments have come from comments where people clearly got my sense of humor and/or sarcasm. The reaction to my Twilight review made me especially happy. I'm also proud that I have not yet allowed myself to waterdown a negative review just because I knew I had to send the link either direct to the author or the publisher. I'm an opinionated person (something you wouldn't pick up on in real life because I'm pretty quiet) and when I love something, you will know. When I don't love something, you'll really know. Then of course there's just the content I've created. It's good practice and has gotten rid of the rust that built up on my writing skills over the years. 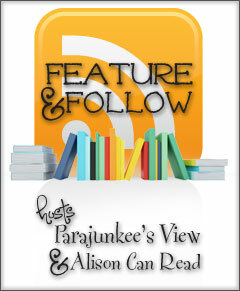 - I gave in and put up my review of Article 5 by Kristen Simmons last night. It's a bit ranty. I also reviewed the audiobook version of Holly Black's Tithe on Monday. - Wednesday had me waiting on The Unnaturalists by Tiffany Trent. - And my book shelves became a little tighter in Saturday's IMM. Unless something finds its way into my mailbox today or tomorrow, we're skipping IMM. There's a very slim possibility that we'll completely redo the site's layout over the weekend, so if you find everything to be broken, yell at Fernando. Have a great (long?) weekend everyone!